At the NAMUR General Assembly (Bad Neuenahr, Germany) on 9 and 10 November 2017, in a combined presentation, NAMUR (represented by Michael Krauss of BASF), ZVEI (represented by Jörn Oprzynski of Siemens), and The Open Group (represented by Don Bartusiak of ExxonMobil), announced that the three automation standards parties agreed to make sure that their three standardization initiatives; Namur Open Architecture (NOA), Module Type Package (MTP) and Open Process Automation (OPA) will be converging to a consistent overall architecture. Compare as-designed engineering data with as-installed information from the plant. Jörn Oprzynski gave a summary of MTP, a package describing the functions of a package unit (including process equipment, instrumentation, actuators and automation) to support enhanced flexibility, shorten time-to-market and reduce engineering and integration time of new equipment or package units in new or existing lines, in a context of ever faster changing product definitions and Industrie 4.0. An MTP is typically generated in engineering, and transmitted during plant construction or modification to facilitate integration in the overarching control system. MTP will contain at least five sub packages: HMI, diagnose/maintenance, alarm management, historical data and condition-based process control. The HMI package is functional and has been demonstrated for several combinations of engineering and control systems. Several VDI/VDE/NAMUR standards have been published, and goals for 2018 include additional new standards and internationalization in the form of IEC standards. 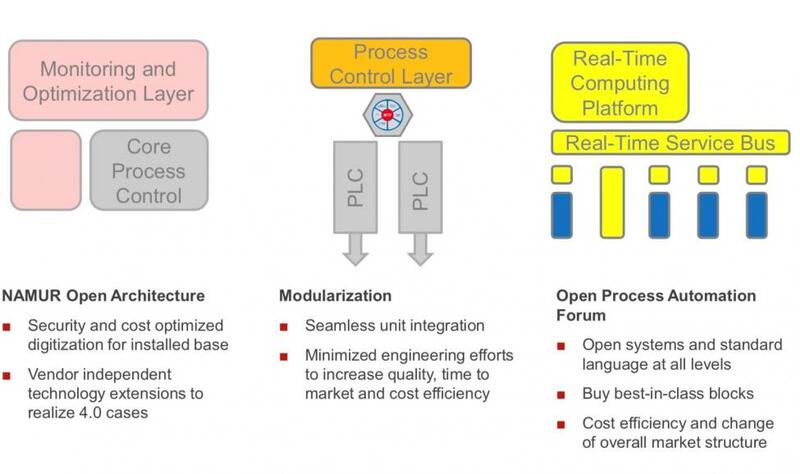 Don Bartusiak introduced the rationale for an open approach to automation, explained ExxonMobil’s reference architecture and gave a progress report and timeline for the prototype, an open automation standard, and commercial systems. Readers can refer to many publications by ARC’s Harry Forbes for more details. Michael Krauss summarized the three initiatives in a graphical concise manner and presented a common architecture for the future. The three initiatives have their own targets that partially overlap, while being complimentary. An overarching goal is to have as few standards as possible. 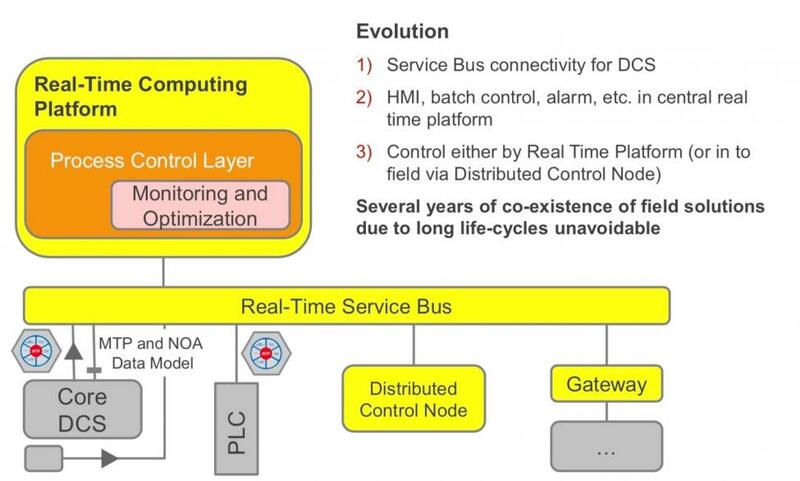 The intent by the three groups is then to integrate MPT and NOA into the OPA reference architecture to integrate existing DCS, PLC and (we expect) existing instrumentation with the new, open real-time service bus, where the NOA monitoring and optimization functions would find their home in the computing platform. ARC very much welcomes this intended alignment, and looks forward to the gain in efficiency in standard development and implementation this will bring to the end users and to the automation industry.